Today's post is another short one. Sorry for the lack of posts this week my friends, it's been really cray with company and school. I'm hoping things will get calmed down soon, and I can make time for regular posts. 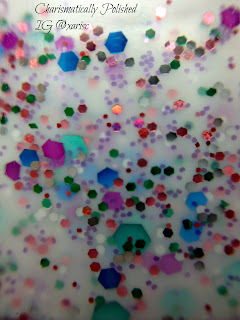 I have some really great nail polish to show you - and I new-to-me indie maker that I'm excited to show you. 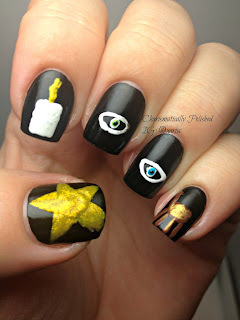 This is Challenge #5 of the Girly Girl Nail Art Challenge - Chick Flicks! Gilly: What are you doing? Sally: I'm summoning up a true love spell called amas veritas, he can flip pancakes in the air, he will be marvellously kind, and his favourite shape will be a star. And he'll have one green eye, one blue. Gilly: I thought you never wanted to fall in love. Sally: That's the point. The guy I dreamed up doesn't exist, and if he doesn't exist, I'll never die of a broken heart. So my nail art for this challenge is Sally's spell - one coat of Cult Nails Fetish, and I used my new Emori Nail Art pen to draw the images, I found them on Amazon at 12 for $7.95, and so far I really like them! The star on my thumb represents the star talisman of Sally's true love, Gary, the candle is one of the factors of the spell casting, one green one blue eye and the animal figure on my pinkie is the pancake shape that Gary made for Sally's kids for breakfast one morning. A simple art mani, but I'm happy with the way it turned out. 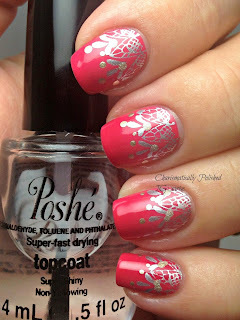 Don't forget to check out the other challenge manis! Happy Sunday everyone! Sorry for the belated post - we have company this week and had a big 'Welcome Home' party for our guest, and now I'm sick! Ah well, on to the post. 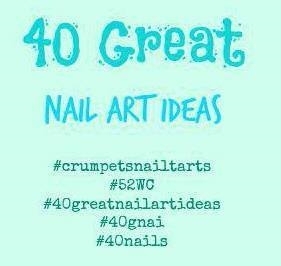 Today's post is another mani Girly Girl Nail Art Challenge on Something About Everything and Manis By Moore. This challenge is to do a mani inspired by fashion. Now you if you've been reading for very long on this little blog 'o mine, you know I have absolutely no fashion sense whatsoever. No, seriously, I don't. I'm sitting in yoga pants, an oversized construction shirt of my hubbys and a zip up hoody. Oh and my toes don't match my nails.- it's sickly wear I tell ya. Anywho - on with the post. Actually, hang on, I have a confession - ok another confession. I went to the nail salon yesterday to get a manicure. Mostly because as much as I try to keep my cuticles and the skin along the side of my nails moisturized, they get pretty gnarly at times, and I don't like to cut them myself. So off I went to my local nail salon - which I have visited before for pink & whites - and I wasn't disappointed in their skill. Since I was there, I decided on a color too, and save me some time on this challenge. Hopefully it's not totally cheating! 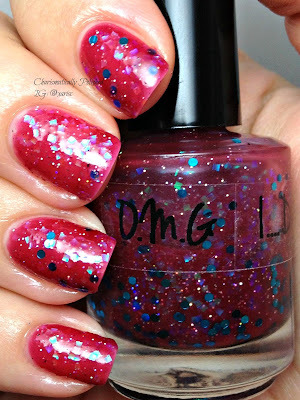 I picked OPI's That's Berry Daring, and my tech applied two coats and a top coat. Then, on with my end of the mani - I stamped in Barry M's silver metallic with A51 stamping plate, and topped it off with one coat of Posche top coat. My design was inspired by Marchesa Spring 2013 Ready to Wear collection. Here is the website that I took the picture from. Phew, this week has taken off with a bang for me! So much to do and I'm still running behind! from my previous post of Pretty Little Glitters - for more info on where to purchase from Polish Addict , see this post. 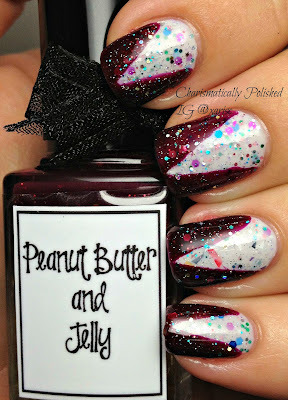 And for the contrast, I used Whimsical Ideas by Pam in Peanut Butter and Jelly. This polish has been a lemming of mine for a long time, and I'm not ashamed to say I squealed when it got delivered, and yes my lovlies, I did kind of cradle it after I unwrapped it. Miss PB&J came with a sister, Kismet's PJ's which will be flaunted in another post :-) You can order Whimsicals via email at pea422000@yahoo.com, and can find her collections along with loads of happy Whimsical owner photos on her Facebook page. 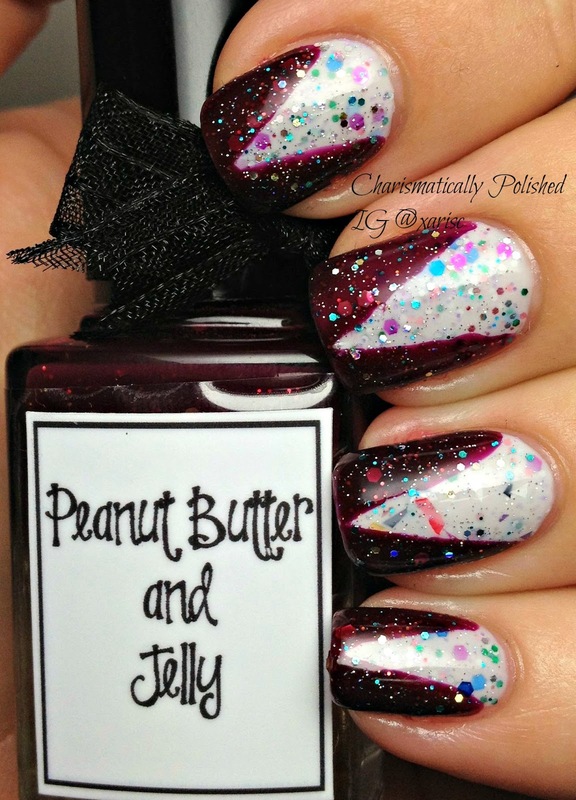 PB&J is a beautiful jelly base that I would describe as a mix between a deep strawberry to red grape jelly in color with 'peanut butter' or gold colored glitter in micro, small and medium hexes. I haven't worn it on it's own yet, so over the white of PLG it is very dark and vivid. 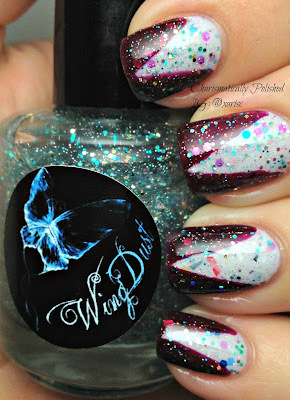 WingDust can be found on Etsy and she has a wonderful variety of polishes, I encourage you to check them out, and dare you to walk away without purchasing at least one. Good Friday evening to everyone! 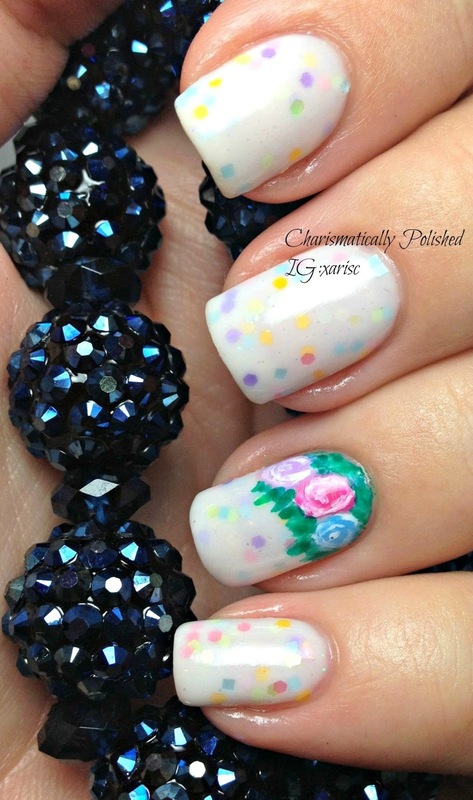 It's a late post, and a short one to boot, but today I have for you the third day in the Girly Girl Nail Art Challenge, Delicate and Elegant. This mani starts with three coats of Carebear Stare from Lacquer Lust, - this is just a beautiful polish starting with a lovely muted white base mixing with micro glitters, pastel orange, light blue, lavender, yellow hex with light blue square glitters. Application of this polish was just as lovely as it's color and glitter - this is three coats (cause I'm greedy like that), dry time is very good, and I finished it with two coats of Posche top coat. The rose art on my ring finger is inspired by the lovely The Nailomon on Instagram - I don't think she has a blog, I've tried to find it, but if you're on Instagram I highly recommend following her. I used some Sinful Colors from the Candy Crush collection and Snow Me White for the roses, and some green acrylic paint, and topped it off with another coat of Posche. Hopefully your week is going well, and there has been lots of lovely polish for you to do lots of lovely manis with, if not, well then by golly you need a treat my dear! 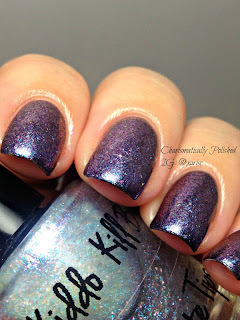 Today's post will supply you with yet another polish to contribute to your addiction; that is if you don't already know this wonderful indie polish - Pretty Little Glitters by Polish Addict. Polished Addict can be found on Instagram, @polish_addict_34 (where I first discovered her) Facebook - My Overnight Addiction to Nail Polish - Big Cartel - and they have a shop at Polished Addict Store Envy where there are some discontinued polishes and blog sale items. I first found found Polish Addict on Instagram, temping me with beautiful photos of her even more beautiful polish! You should definitely check it out and see the variety of her polishes so perfectly demonstrated by her customers and swatch bloggers. I think that's one of the things I love about following indie polish makers on Instagram, and other social media platforms - you get to see all the different users either tag or hashtag the maker/polish names which gives you such an album of skin tones, colors nail shapes and lengths that can help you decide which polish should be yours. This is Pretty Little Glitters is a smooth, milky white base littered with micro red, lavender, small white, green, purple, pink hex and medium blue, lavender, and green hex glitters. The formula is wonderful, I had no issues with applications. Because it is a milky white base, it does take about two to three applications to make it opaque, but again, the formula was great. In this picture, I have three regular coats of PLG on (with one coat of PA's Drunken Elephant on my ring finger, more on that for another post) and two coats of Essence Better Than Gel top coat. This is pictures has three coats on my first finger, two coats on my middle finger, and another ringer finger accent of Drunken Elephant (do you see that awesome big round black glitter?!?!?!) I wanted to show you the difference between the second and third coats - I'm sure you could do two coats of Pretty Little Glitters with white or neutral undies, but the formula dries well and it really isn't inconvenient to do three, especially when the third does the trick properly. In case you couldn't tell, I really love this polish. I'm on a white and glitter polish kick these days - it's so fresh and happy without being over the top, you know? What's on your nails this week?!? Don't take my word for it, go check out Polish Addicts site today! I think she's got something for just about everyone! Good morning my friends. If you weekend was like mine, it ended way to quickly! Today is a short post, it's a busy day for me, but I just couldn't wait to show you another one of Ruby White Tips on Etsy amazing creations. 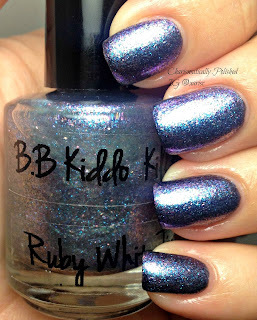 This lovely polish is BB Kiddo, from RWT's Kill Bill Collection and a Limited Edition polish. If you've never seen Kill Bill, I have to tell you, it's an experience, not just a movie. I'm not a Quinton Tarantino fan, and I don't mind saying that I laughed through most of the move - but I think that's part of the charm of his movies and cult movement that he's inspired. They're just so absurd, that they're fun. :-) BB Kiddo is perfectly named, fitting the shiny, sweet little girl who played BB - here is a clip from YouTube. I have layered one coat of BB Kiddo over one coat of Cando Colors in Skaul. Originally, I was going to layer it over black, as is shown by Things I love At The Moment blog, but as I was looking through my indies, I found Skaul and I thought it would be a good base to really show off BB Kiddo uniqueness. It is a shifty polish, (in the right ways a polish should be) flexing back and forth between predominantly purple and pink, though in my opinion there are some flecks of teal blue from time to time. The formula is great, it spread evenly and covered well without streaking, clean up is always a challenge with glitters this small, but I thought it cleaned up pretty well. I'm also happy to report that not only is it a gorgeous polish, it's also a sturdy one. After painting my nails Friday morning, my mani is still going strong with very minor tip wear. 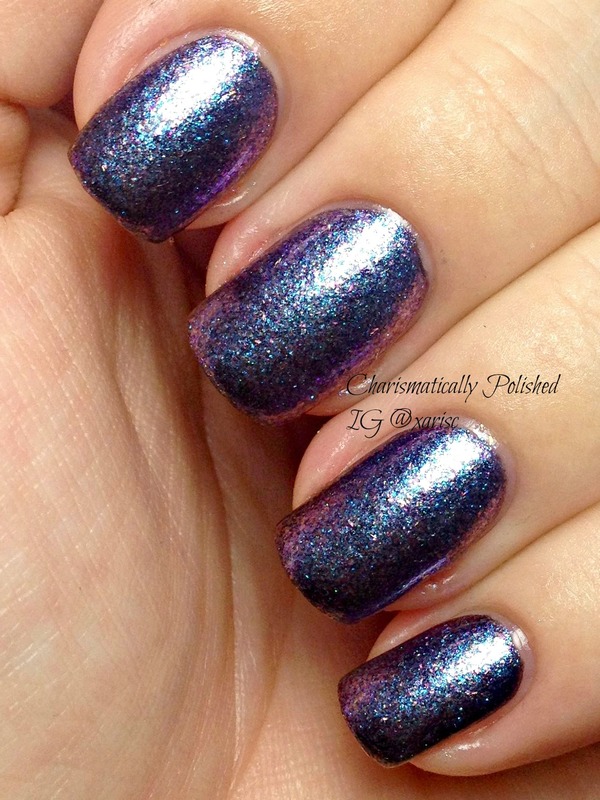 The first photos is BB Kiddo over Skaul with one coat of Poshe top coat, the second photo is Skaul solo. It was really hard to get good shots of this polish, they just don't do BB Kiddo justice. 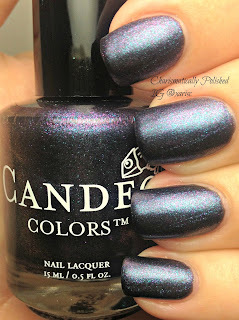 It's definitely a polish you should experience for yourself, if it's your kind of color. 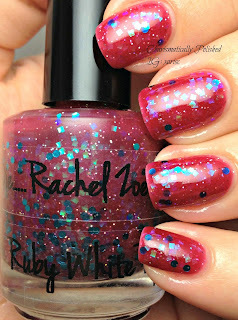 Ruby White Tips also has a Website where you can stay up to date on their latest news and specials. There is a sale code good til midnight tonight 4/8 for 30% off on polishes, excluding Batworld.org and the Mystery Bags. Better hurry and get your Ruby White Tips! 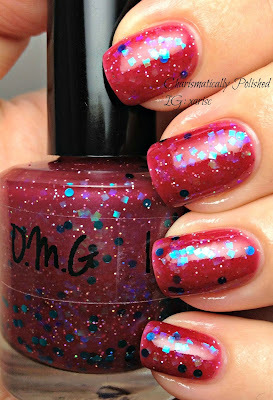 Today's post is on some nail polish strips by OMGNailStrips.com. I was contacted last week by a representative asking if I would like to review a couple of their products. I had not heard of this company or products before, and was a little skeptical at first as I haven't had very good luck with nail strips and haven't seemed to care for them, but I am very glad that I gave them a try. Their website for ordering is OMGNailStrips.com, and there is also a Facebook Page where you can see customer pictures and comments. There is quite a nice variety of styles for the nail polish strips and foil prints, with the average price for the polish strips and foils running about $4.29 and what looks like free shipping as of right now - even for international, at least that's what I uncovered. 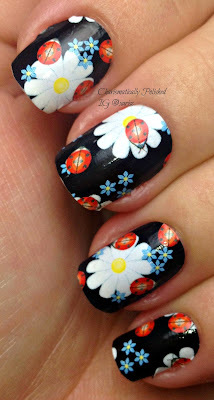 The products I chose for review were their Black Floral Pattern Nail Polish Strips and Speckle Nail Polish Strips. This post will feature the Black Floral Pattern and I will do a short review of the Speckle strips later. 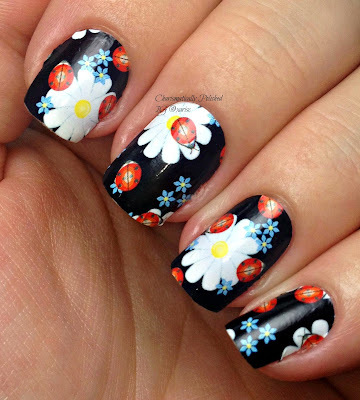 I'm also writing the post within the day that I've applied them, so I will let you know how well they lasted on the post of the Speckle Nail Strips. :-) So far, I really like them. The instructions on the back of the package were easy enough to follow, though in my opinion, were lacking a bit in detail and grammar. If I didn't already have some experience with nail polish strips, I don't think they would have turned out so well. But again, that's just my observation. 1) Our elaborate design and unique new environment friendly materials provides excellent air permeability and adhesion for your nails. Your choice of will hold your nails harmless from any nail polish. 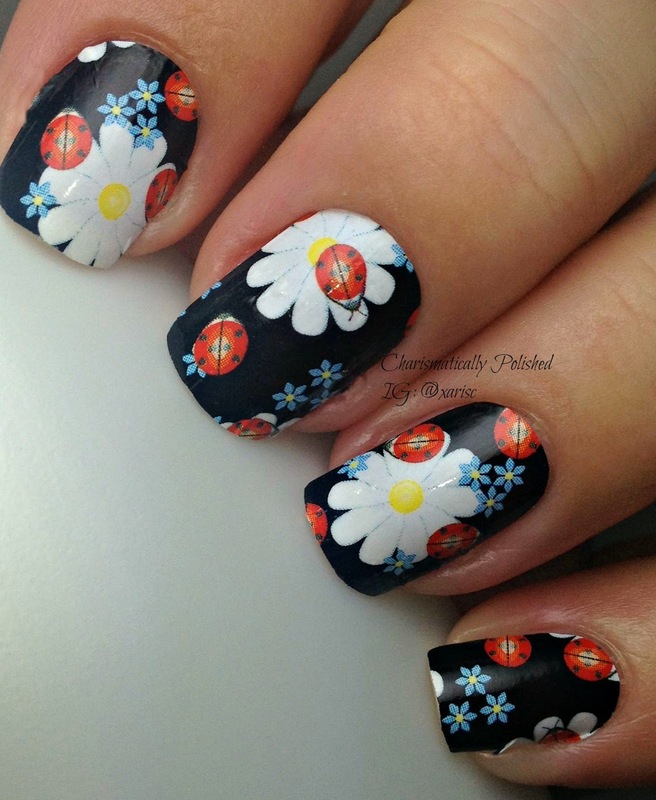 you may quickly beauty up your nails anytime and anywhere, without tools. 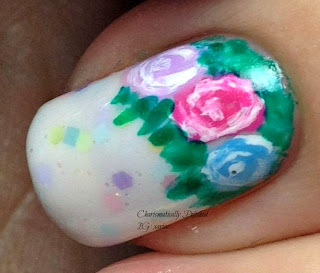 5) Push the nail sticker from the inside radically our to the edge and scrape it. 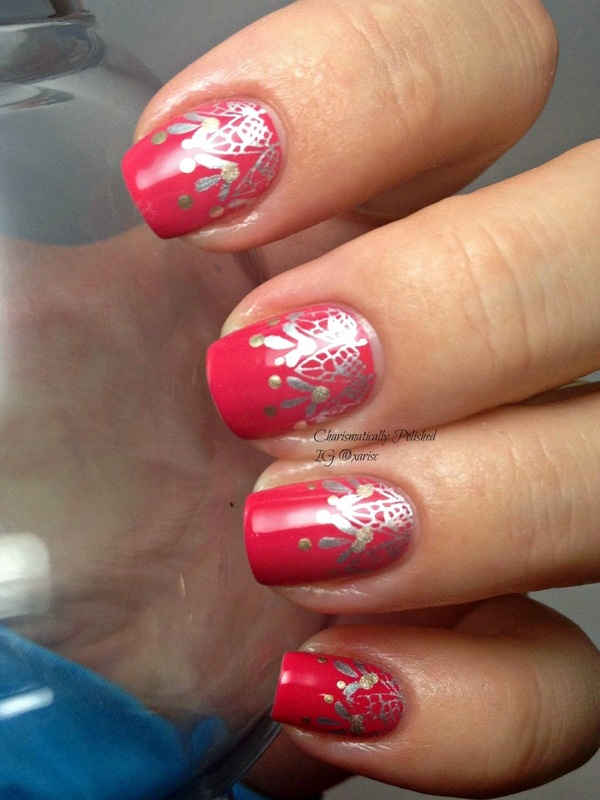 6) Remove the needless nail sticker along with the edge of the fingernail. 7) Carry out UV seal against the nail sticker according to personal requirements. 8) Clean-up; Dip your nail into warm water of 50 Celsius degrees for 8 minutes, remove nail sticker and wash it with hand sanitizer or nail polish remover. 2) I used acetone nail polish remover and wiped my nails down to remove any natural oils or soap residue. After this, I followed directions #2-6 on the nail package, with the exceptions of using a large round dotting tool to help burnish some of the creases out (cause I'm clumsy) and seal the cuticle edge to my nail, and I used a nail file, using downward strokes, to remove the excess nail strip from the free edge of my nail. I wasn't really sure what the meaning of #7 was, I'm assuming that this means a top coat but I decided against using a top coat just to see how they do on their own.. There are 14 nail polish strips in each package, and the shape and sizes of the strips were enough to find a close match without being too small or too large. After reading the instructions prior to application, it was evident to me that these polish strips are probably not meant to last long term, (my definition of long term is a week to two weeks for polish strips) as it is noted that removal can be accomplished with soaking your hands in warm water for 8 minutes. The polish strips are very thin, which I like, and easily manipulated to fit properly. One of the biggest reasons I don't buy nail polish strips is because the Sally Hanson and Kiss brands I tried were thick and didn't adhere properly. A couple of times I started to apply it and realized I had it crooked, carefully peeled the strip back up and reapplied it without any apparent loss of adhesion, and the image didn't warp when peeled back. You do want to be careful not to stretch them too much, it has a tendency to create wrinkles that are difficult to smooth out. All in all, I was very pleased with this product, I would definitely recommend it to my friends and readers, and will most likely be purchasing more products from them in the future. Ruby White Tips - O.M.G. Happy Monday my lovelies! I hope you've all had a wonderful weekend! We actually had clear skies and sunshine in my neck of the woods this week - it was perfect, we joined in a block party and the kids played out side for hours!!! I have the very special privilege of writing a review of a new polish by the brilliant Laura at Ruby White Tips. You will be able to find this polish, and many other of the amazing creations of Ruby White Tips on Etsy - they also have a website Ruby White Tips where you can read some of the polish reviews, find out more information on the bat sanctuary that RWT supports, and there's even a mailing list that will keep you up to date with the latest news and new products. My friends, I'm pleased to show you OMG I....Die.... Rachel Zoe Inspired. Now I won't lie, I have absolutely no sense of fashion - no, seriously I don't. I'm a jeans a t-shirt kind of girl. Unless I'm staying home all day, then it's yoga pants and t shirts. 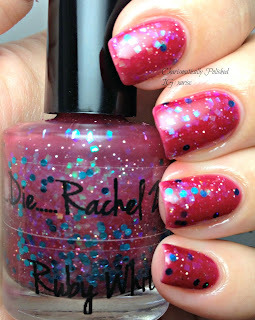 :-) So when I got the polish to review I had to look up who Rachel Zoe was - and wow she's amazing. What an awesome career to be able to design such fabulous attire for some of the top stars walking the red carpet. I can't imagine the versatility she has, to be able to choose so many styles and coordinate them with all the personalities she works with - that is a cool gift to have. 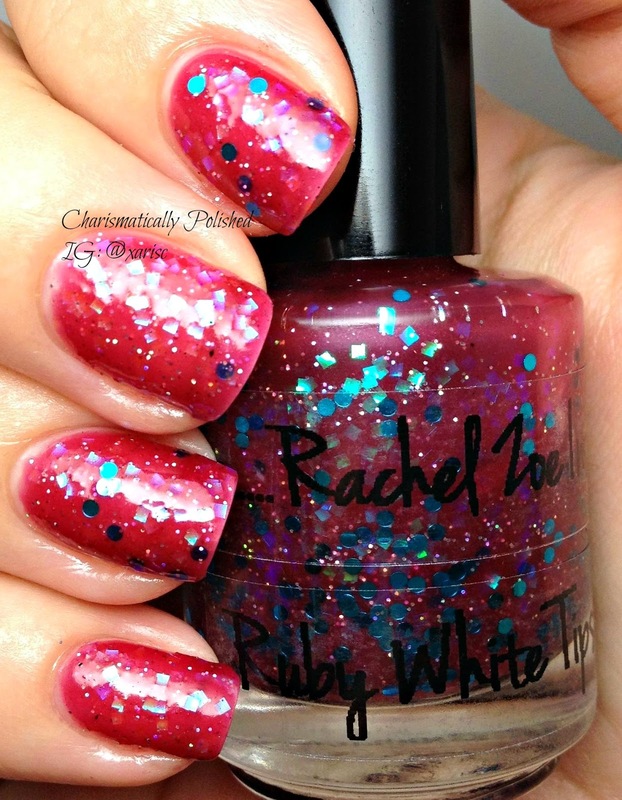 After learning about Rachel Zoe, this polish is perfectly named. 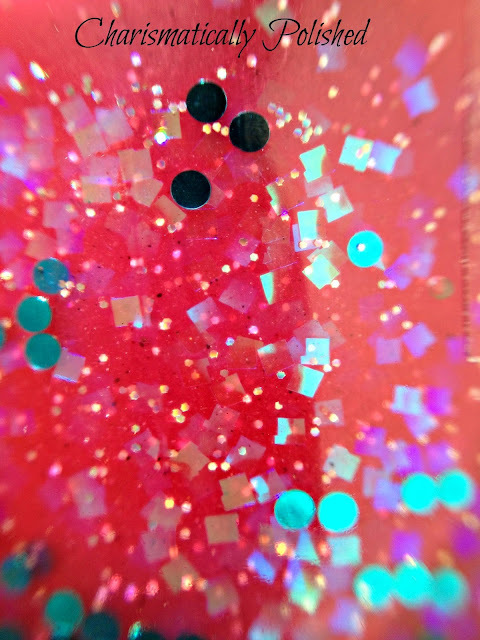 This fashionable polish starts with a beautiful red raspberry jelly base with orange and blue square glitter (which in my humble opinion can refract some subtle purple hues in the sunlight), medium round teal glitter, and micro holographic glitter. I gasped when I saw the bottle, and wasn't the least bit disappointed when I started applying it on my nails. The formula is just right and applied easily, and the glitter to base ratio is perfection - everyone mingles and settles on your nail just beautifully, and dries with a bit of a texture to it.This polish could probably be layered over another with a similar color base, but my photos are the polish by itself, with two coats of Posche top coat. My right hand has two coats of OMG and my left hand has three coats - there isn't much of a difference between two and three coats of the polish so far as the color being much darker, but to me it did make the polish have more depth to it. Warning: I took a lot of photos for this polish! The teal glitter does a wonderful job of being the contrast and eye catcher of the mix, but it is more sparse than the flakies and holo glitter - so if you get greedy about it (like I did) then I recommend that about every other application, you close the bottle up and turn it up side down for about 30-60 seconds then give it a couple of good rolls in your hand and that should give you some more glitter to capture on the brush. Trust me my friends, this is a must have polish. It's fun, fresh and classy all rolled into one. But hey, don't take it from me, grab your own bottle and discover it for yourself :-) And I'm so happy to report that RWT does ship internationally!!!!! Here is a lovely macro I took of the polish in the sunlight. 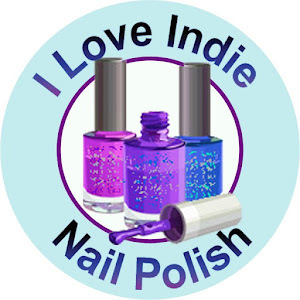 Can You Tell I Love Indies?